William Astore, Op-Ed: The president and his campaign staff are no fools. Since any sign of “weakness” vis-à-vis Iran and similar enemies du jour or any expression of less than boundless admiration for our military will be exploited ruthlessly by Romney et al., Obama will continue to tack rightwards on military issues and national defense. As a result, once elected he, too, will be a prisoner of the Complex. In this process, the only surefire winner and all-time champ: once again, the national security state. Nomi Prins, Op-Ed: Financial history has a sense of irony. JPM Chase was the post-Glass-Steagall repeal marriage, 66 years in the making, of Morgan Bank and Chase. Today, it is the largest bank in America, possessing greater control of the nation’s cash than any other bank. It also has the largest derivatives exposure ($70 trillion) including nearly $6 trillion worth of credit derivatives. It is the size of a bank holding company’s deposits that dictates the extent of the risk it takes, risk ‘models’ not withstanding: the more deposits, the more risk, the more potential loss. Wendell Potter, News Analysis: The Congressional Budget Office projects that the average annual growth in Medicare spending will be 5.8 percent between 2012 and 2020. It would have been one percentage point higher than that, according to the CBO, if not for the cost-constraining provisions of the Affordable Care Act, most notably the one that will gradually eliminate the bonuses the government pays private insurers to participate in the Medicare Advantage program. 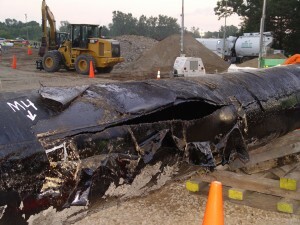 Lorne Stockman: When Enbridge’s Line 6B burst open near Marshall, Michigan in July 2010 spewing over a million gallons of tar sands sludge into the Kalamazoo river watershed, funds were quickly released from the Oil Spill Liability Trust Fund to mobilize Environmental Protection Agency staff and other federal employees to assist and monitor clean up. But the tar sands companies that produced the oil that is still polluting Talmadge Creek nearly two years later have never paid a penny into the fund. Why? Because when payments into the fund were reinstated by the 2005 Energy Policy Act following a hiatus, someone convinced the IRS that tar sands crude was not crude oil, and therefore did not need to pay. Paul Buchheit , Op-Ed: Privatization simply hasn’t worked for health care, mortgage banking, higher education, or prison management. There is little incentive for profit-motivated firms to invest in disadvantaged or underemployed Americans. That’s why taxes are necessary — to provide for the common good, and to return some of the gains from 60 years of productivity to the great majority of Americans who contributed to our growth. David Sirota, Op-Ed: The result is that America has become the true "Lord of War," as the arms dealer motto goes. We are the leading arms supplier to the developing world and we are responsible for the majority of all weapons sales across the globe. Yes, we are so committed to selling instruments of death to the rest of the planet that military industries have almost tripled their share of the U.S. economy in just a decade. Susan Aarde, News Report: What is the buying public to make of such conflicting data? Those who have medical conditions which require complete avoidance of toxic seafood need to know with certainty what they are eating. Likewise, the fishermen in the Gulf need to know the true condition of their catch. Swimmers and beachgoers need to know the state of the water, as well as the beaches. Boaters ought to be informed of the relevant risk factors when out in the areas of recently sprayed waters, whether surface or deep sea. Stephen Leahy, News Report: The good news is this has slowed the rate of global warming. The bad news is oceans are now more acidic and it will get worse as more CO2 is emitted. This is basic, well-understood ocean chemistry. Gao and his team made several trips into the South China Sea taking samples from surface waters where phytoplankton are found. While still on the research vessel, those samples were made as acidic as the oceans are likely to be in 2100 without major emissions reductions (800-1000 parts per million compared to current 392 ppm). Pat Garofalo | ThinkProgress: In a speech Tuesday, House Speaker John A. Boehner (R-Ohio) plans to address the issue of national debt, which will once again be nearing its legal limit in January, just as the tax hikes and spending cuts are due to hit. According to advance remarks provided to The Post, Boehner will insist that any increase in the debt limit be accompanied by spending “cuts and reforms greater than the debt limit increase” — the same demand that pushed the Treasury to the brink of default during last summer’s debt-limit standoff.